Barcode Technology is pattern recognition driven by optical sensing. The first barcode system was installed in 1961 on a railroad for reporting the whereabouts of freight cars. The research effort that preceded this product introduction explored many methods of freight car marking (or labeling) and many methods of mark sensing before settling on an optical marking and scanning solution. Extending the marks that coded digital values from dots, or squares, to bars was driven by the need to read these labels while a train traveled past a scanner at 60 miles per hour and the fact that scanners had to be six feet from the train. Given the sensing and digital component state-of- the-art in 1960 the bars had to be 6 inches long for a label about a foot and a half high to produce reliable results. The relative ratio of barcode width and height stayed about 3:1 or so for many years after that. The use of color in the freight car coding method (black/white/red/blue) was efficient because white light illuminated the label and color coding reduced label size. When the laser became commercially available as a light source about 1970 and print technology improved, barcode color was discontinued. Now, with inexpensive color print technology new color-based barcodes are emerging again. The freight car barcode system stands as the point of origination for all the barcode development as we know it today. The railcar identification system became the North American standard (US and Canadian) for railroad deployment in 1967. International sea containers and rail-born highway trailers were labeled and reported by this system through the decade of the 1970s. The first deployment of lasers to scan black and white barcodes followed from the founding of Computer Identics Corporation in 1968. 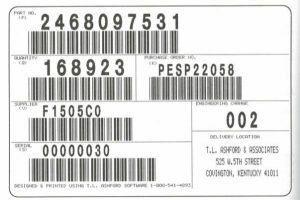 The US automotive industry began deploying this barcode label and scanning technology for production control and material reporting beginning in 1971. The Automotive Industry Action Group (AIAG) was formed to develop international automotive industry barcode standards, including specifications and formats. This move accelerated barcode use throughout the factory and in automobile delivery to the customer. Computer Identics delivered the first scanners used for package recognition in 1971, also. This established the application used by FedEx and UPS to deliver millions of packages every day in the US and around the world. The next time you receive a product one or two days after you’ve ordered it on Amazon, remember that barcode scanners enabled that application, too. The retail grocery and general merchandise industries discovered the benefits of using barcode and laser scanners beginning in the mid-1970’s. Their initial focus on achieving benefits with scanning included significant customer flow in point-of-sale transactions through instantaneous and accurate price look-up. The elimination of individual item price marking cut labor cost dramatically and paved the way for dynamic pricing. An international organization (GS1) guided the development of retail barcode standards, first in supermarkets and then throughout most of the retail community. 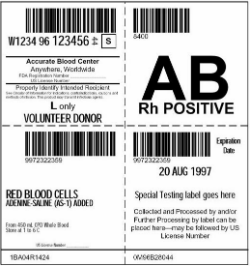 The US Department of Health and Human Services through the FDA (US Food and Drug Administration) requires stringent barcode standards for blood bank activities in order to minimize mistakes in this vital function. In 2004, the FDA published a rule requiring manufacturers, repackers, relabelers, and private-label distributors of drugs to include linear barcodes that contain at least the drug or biological product’s National Drug Code (NDC) on the labels of certain human drug and biological products. One of the most far-reaching barcode based programs was mandated by the Department of Defense a few years ago. 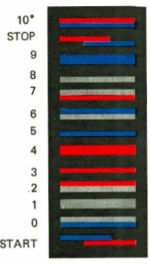 They call for Item Unique Identification (IUID) of military assets through the use of a unique label format using the Data Matrix two-dimensional symbology. The IUID data elements to create the MIL STD 130 label consist of pedigree information (i.e. manufacturer’s code, part number and serial number) and other identifying elements, which can include physical features, material composition and more. Property and material details must be captured and formatted accurately to complete a process that creates an item birth record. An estimated 122,000,000 military assets require reporting to the IUID Registry. Deployment of these traceable assets around the world and a record of their use will result in huge savings in DoD future budgets. The pace of barcode innovation in our lives has been influenced by the development of companion technologies. The mobile smartphone will have long-term impact in enabling many more barcode based solutions to daily challenges. App developers have a “free” barcode scanner to turn to and a “free” barcode print technology in the mobile phone package. Look for barcode application expansion for decades ahead, governed only by the needs of each evolving lifestyle. For a chronological, detailed timeline of barcode history, click here.